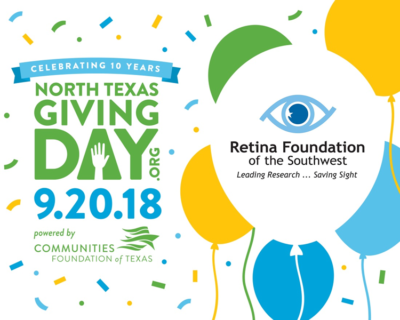 Thank you for donating to the Retina Foundation of the Southwest during the Communities Foundation of Texas’ 10th annual North Texas Giving Day, a one day online giving extravaganza for our whole region. Thanks to you, we raised $47,612 on September 20th, bringing us a step closer to a lifetime of good vision for all. For more information on North Texas Giving Day, visit NorthTexasGivingDay.org.